Mining – and not just juniors – needs to tell a good story to attract investors into what is a notoriously tricky and volatile industry. With China's infrastructure build-out peaking, the global auto industry’s transition to electric vehicles now provides that narrative. And perhaps start the next commodity supercycle. The next few decades will be a rocky road for the mining industry and its backers (but it’s always been thus). For automakers however, electric vehicles are beginning to look more like a highway to hell. The automotive industry faces the possibility of a monumental capital drain in the near term as hundreds of players, including non-traditional ones, are all pouring unprecedented sums into electric and autonomous vehicles years before those technologies are fully cost-competitive in the market, when consumers are questioning the cost and safety of some of the technologies, and just as the market itself is set to continue a cyclical downturn. The AlixPartners study sees an eye-popping $255 billion pouring into research and development and capital expenditures to bring some 207 electric models to the market by 2022. A further $61 billion has been earmarked for autonomous-vehicle technologies according to the study. 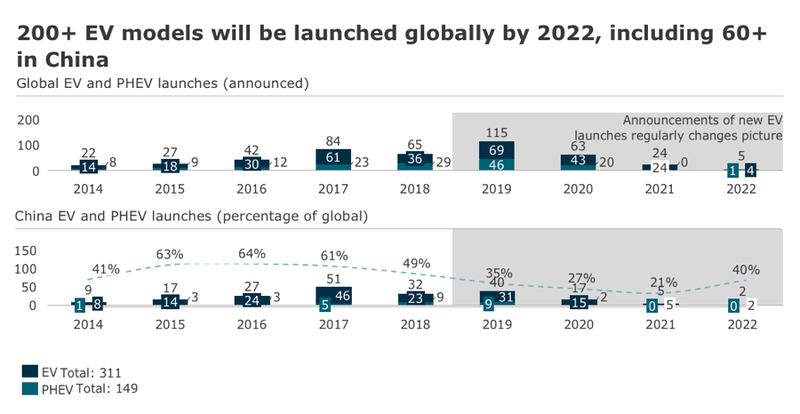 As an indication of just how focused the global auto industry has become on EVs, the consulting firm, calculated that 55% of M&A in the sector over the last two years were in some way connected to electrification or autonomy. The authors forecast that growth for global auto market will decelerate to an annual clip of 2.4% through 2025 and the US market will continue its cyclical downturn this year and by the end of the decade would be 2m units below the 2017 tally of 17.1m vehicles leaving showrooms. 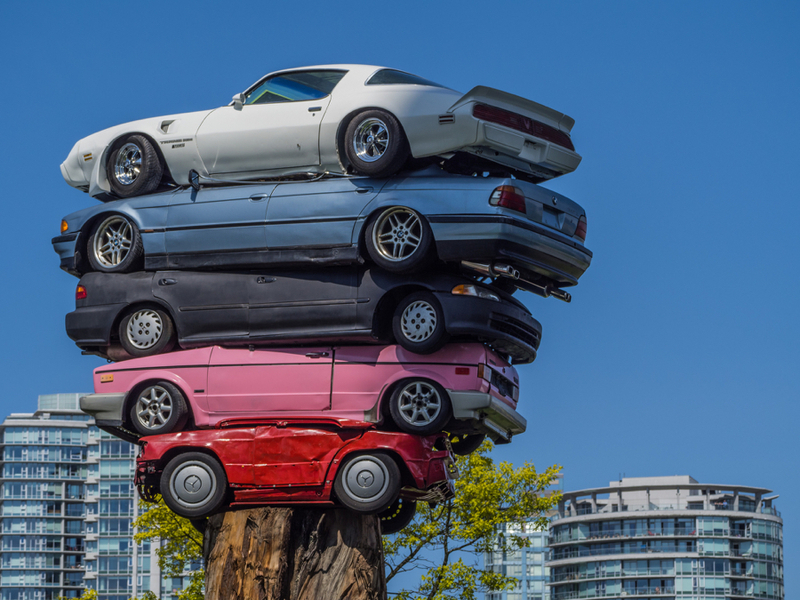 The AlixPartners study finds that automotive-related commodity costs jumped to six-year highs in 2017 —up 70%, or $884 per vehicle, since 2015. 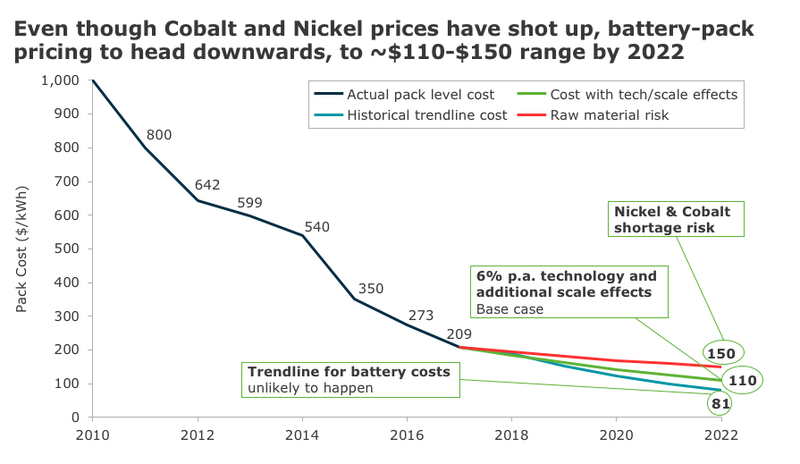 Should key battery metals prices continue to rise, it could make life more difficult for automakers already selling EVs at a loss amid fierce competition, low volumes and disadvantages to internal combustion engines. A US dept of energy study pegs $125/KWh as the level at which EVs achieve parity with ICE vehicles (see chart). Despite these headwinds AlixPartners are upbeat about EV penetration rates. The firm’s survey of US car buyers found that 22.5% said they’re “likely” to purchase a plug-in electric vehicle as their next car. The China vehicle market is forecast to grow to 29.1m units this year, on its way to 38.2m in 2025 (equal to 52% of global volume growth over that period) says AlixPartners. By 2030, 40% of vehicle sales in the region will be EVs. The European car market is likely to expand by 2.5m units by 2030 to reach 23.1m units annually with a roughly 30% penetration of EVs by that time. The US will lag and only 16-21% or 2.6m–3.5m of sales in 2030 is likely to be electric.